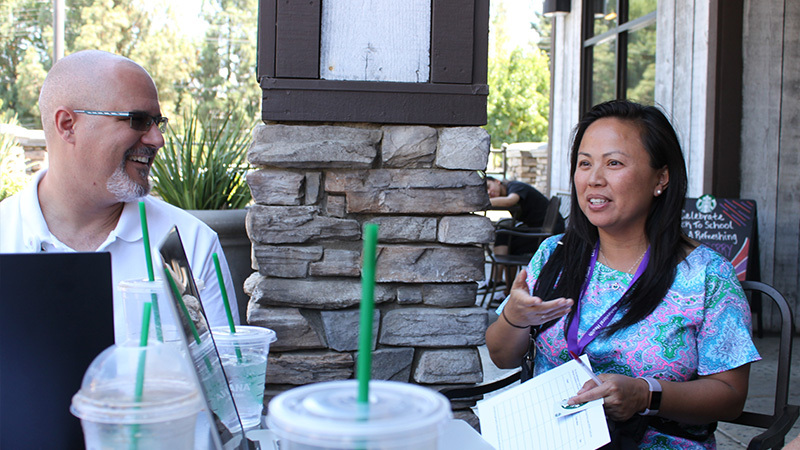 The School of Behavioral Health recently hosted three alumni meetings at Starbucks locations in the Inland Empire. These meetings provided an opportunity for alumni to reconnect with one another, network, and hear the latest information about events occurring within the School and the broader University. Just a few of the updates included the publication of the first SBH alumni magazine, the development of an integrated field placement in Samoa, major research projects within the departments, and the addition of new faculty. Just as importantly, alumni shared some wonderful updates with us about their professional careers and their families. Dean Beverly Buckles, Dr. Adam Aréchiga, Dr. Winetta Oloo, Dr. Kim Freeman, Kemi Adeoye, and Terry Forrester attended the meetings on behalf of the School. Everyone enjoyed the experience of reconnecting and discussing future aspirations and goals over a delicious Starbucks treat! View more photos from the Riverside, Colton, and Loma Linda meetups.